The Red, White and Blues Air Show is a summer highlight on Florida's Gulf Coast. 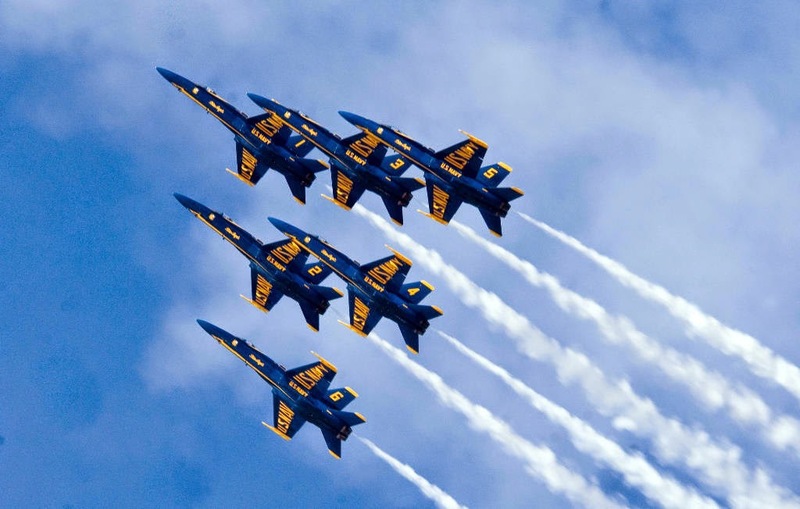 The Pensacola Beach air Show featuring the Navy Blue Angles is an annual ritual for many locals and visitors who travel by boat, car, motorcycle and bicycle to attend the exhilarating event.. The Blues return to the Pensacola Beach sky on Saturday, July 12 - with Pensacola NAS their home base, the Blues can also be seen continuing their regular weekly practices at Naval Air Station. The civilian show begins at 1 p.m. with the Blue Angels following promptly after. You can see the show twice by attending the full dress rehearsal on Friday, July 11 at 1 p.m. Along with the Blue Angels, many local favorites will be featured in the civilian air show, including extreme pilot Skip Stewart and his modified Pitts S-2S, Prometheus, Gary Ward and his MX2, and back by popular demand, Team AeroDynamix, the world’s largest air show team with 11 experienced pilots with over 90,000 hours of combined flight time in more than 100 different aircraft. Saturday, July 12th Casino Beach Civilian Show at 1 p.m. Blue Angels at 2 p.m. Rain Date Sunday, July 13, 1 p.m. Only if Saturday is rained out.